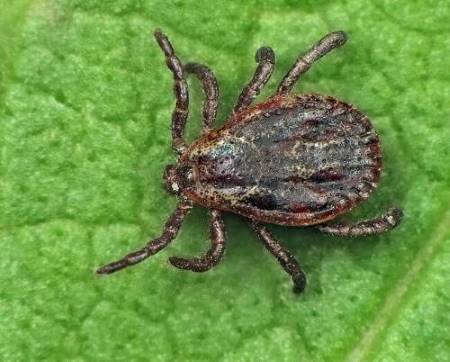 Learn more about dog ticks: what diseases they cause; how to find them on your dog; how to remove them safely and quickly; and how to protect your Cocker Spaniel from them in the first place. In order to know how to keep our Cockers safe from dog ticks, it's essential to understand a little about them, their habitat and the diseases they transmit. Dog ticks are spider-like parasites that feed on your pet's blood. Of all the unwelcome visitors your Cocker Spaniel is likely to bring home, these are probably one of the most unpleasant. Aside from being pretty yucky, they can cause many nasty diseases (some fatal) and should be removed from your Spaniel immediately. I'll explain how to do that later. Although it's possible for dog ticks to infect humans too, they still prefer to feed on canines. Depending upon climate and environmental conditions, ticks may be active all year round. However, they're usually more active during the spring and autumn months and can be found in tall grasses, pastures, weeds, moorland and woodland. How Do They Hitch A Ride? Just like dog fleas, ticks are attracted to movement, vibration and warmth and will lurk in vegetation awaiting the unsuspecting passer-by. When a warm-blooded animal (or human) brushes past, the warmth and vibration will trigger this parasitic hitch-hiker into action and it will climb onto the host. It will then crawl through the coat towards the warmth of the skin where it will settle in a crevice or a place with little or no hair. What Happens When Dog Ticks Feed? The tick pierces the skin and begins to feed on your dog. As it feeds, its body fills with blood and becomes engorged (about the size of a pea). It also changes colour to a lighter grey, making it much easier to see. Pesky dog tick after it had fed on Max! The parasite won't release its grip until it has finished feeding, which could be anywhere between 5 and 7 days! It's during this time that one of the parasites that live inside the tick (spirochaete bacteria - which causes Lyme disease) makes its way out of the tick and into the host's bloodstream. There's also a video of a tick feeding. It's a bit gruesome, but well worth watching. Here's the link to the article, I hope you enjoy it, but don't forget to come back and finish reading this page. What Diseases Can Dog Ticks Transmit? Not all of these diseases are common in the UK, but they can be found in other parts of Europe, Africa and the United States of America. Ehrilichiosis (only a handful of cases found UK). Learn more about their geographic distribution within the USA. A more comprehensive list showing their general habitat and preferred hosts can be found here. As well as passing disease to our dogs, fleas and ticks can also transmit disease to us too! It's really important that all ticks are removed as soon as you spot them, whether on human flesh or our dogs; the sooner you remove a dog tick, the more you reduce the risk of disease. and in the worst cases, death. If you or your pet display any of the above symptoms, particularly if you've recently had a problem with ticks or you've been abroad, it's advisable to contact your doctor and/or your vet immediately. Run your hands over his muzzle, head and neck and then check his ears: inside, outside and behind. You're feeling for lumps, bumps or spots on the skin. Next, run your fingers through his coat on the underside of his belly and towards his 'bits'. Run your fingers around the underside of his tail. Do the same with the top and sides of his body. Check his legs and paws, not forgetting to feel in between his toes. Last but not least, check his 'armpits' because this is one of their favoured places. If you feel a lump, part his coat and take a look to see what's there. Depending on how long the tick has been attached, it will vary in size from a tiny pinhead to the size of a large pea. Read on to learn the safest way to remove a dog tick. If it's not yet attached, you can simply pick it up and dispose of it. For removal of ticks that are attached, you can buy a special tool called a 'tick picker'. It's a two-pronged fork-like gizmo which grasps the tick (so you don't have to!). Top Tip: Use fine pointed tweezers rather than blunt flat ones, which are more likely to squash the body of the tick and cause potentially infected blood to be squeezed back into your pet's bloodstream. Place the tick remover above the dog tick, making sure the body is in the wider part of the tool before placing it flat on your pet's skin. Pull the tick remover slowly backwards to 'trap' it in the fork. Once the tick is securely gripped in the tool it can be lifted upwards, away from the skin. Do not twist the tool. Pull the tick out slowly and carefully. Your aim is to remove the entire tick intact. If you twist the tick as you pull, it's possible that the body will break away from the head and mouth-parts, leaving them embedded in the skin which can lead to irritation and infection. If you accidentally leave the head in, use a pair of tweezers to pull it out and dab a little antiseptic on the wound. Once you've removed the tick, place it in a small screw-top jar while you see to your dog. If your Cocker bleeds a little, use a clean tissue or cotton wool pad to cover the wound and apply gentle pressure until it stops bleeding. Clean the puncture wound on his skin using either an antiseptic or a solution of gentle soap and water. I recommend you keep an eye on this area for a couple of days and if it becomes infected, take him to see his vet. Dispose of the tick and then wash your hands thoroughly. When removing the tick by hand always wear disposable gloves to avoid coming into contact with bacteria or infectious germs. Don't put yourself at risk. Pinch the underneath the tick's head (as close to your dog's skin as possible) and gently pull the tick out. Be very careful not to squeeze the body otherwise potentially infected blood may be forced back into your dog's bloodstream. Remember, the closer you nip to the skin, the less chance there is of the tick's mouth-parts remaining embedded in your Spaniel. Once you've removed the dog tick, dispose of it very carefully. Put it into a small jar with a tight fitting lid. Pour in enough rubbing alcohol to submerge the tick. Wait until it dies before flushing it down the toilet. 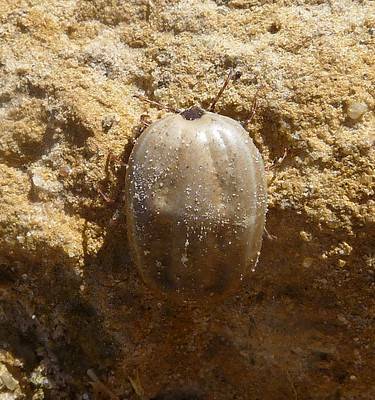 Top Tip: Don't be tempted to squash the tick as it could be contaminated with harmful disease or bacteria - stay safe! Seal the tick inside a plastic bag or using sticky tape, tape the tick to a piece of card. Write the date on the card to remind you when and where it was removed from your pet. 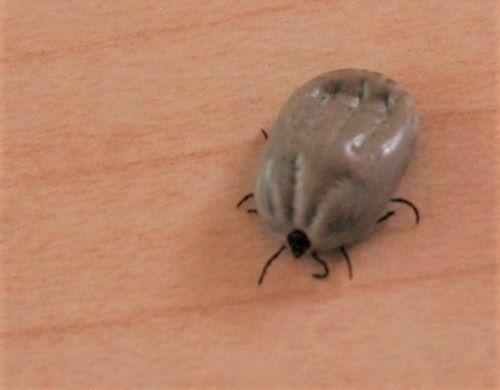 If you keep the tick for say 3 months, and during that time your dog shows any symptoms of disease you can pass the tick on to your vet who will be able to have it tested to help with diagnosis. 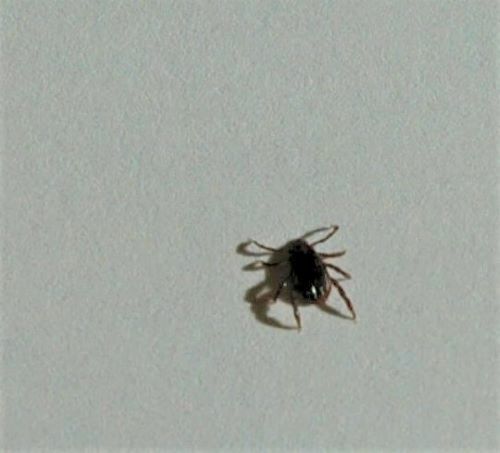 There are some who recommend burning the tick with the end of a cigarette or a hot match head to force the tick to release its grip on the skin. I don't endorse this method because it's too dangerous and could burn your Cocker Spaniel. Nor do I recommend using things like alcohol or nail varnish remover. They will not release the tick. In addition, you can't kill a tick by flushing it down the toilet. The only safe way to remove it is to use either a tick removal tool, a pair of fine tweezers, or by hand. If you're squeamish or worried about touching the tick, or about disease, invest in a box of latex gloves, the type that doctors and dentists use. There are many treatments available to guard against ticks; shampoos, sprays, tick collars, dog tick powder. You may need a prescription from your vet for some products, but most are available without prescription and can be bought direct from your local pet store. The ‘spot on’ products that are advertised for tick and flea treatment are very effective (however you'll need a prescription for some lines) and need to be applied correctly in order to be fully effective. If you prefer a more 'natural' approach, you can buy a herbal preparation from a health shop or you can make your own. Apple cider vinegar will help to make your dog's blood more acidic, which (apparently) ticks and fleas find distasteful. Simply add two tablespoons of apple cider vinegar to your Spaniel's food or water bowl (or one tablespoon in each). Alternatively, you can use it to bath your dog with. Make up a solution of 1 part apple cider vinegar, 3 parts water, and a small squirt of baby shampoo. Wet your dog thoroughly and then rub this mixture into his coat and lather well. Just make sure you get the solution in all the usual hiding places. Citrus oils make a great natural tick and flea repellent. Cut any citrus fruit into quarters (orange, lemon, lime, or grapefruit) and place in a large heatproof bowl. Add a pint of boiling water and cover. Leave to cool overnight before squeezing the fruit and straining. You can use this liquid either as a final rinse after bathing your dog or you can put it into a spray bottle and spray his coat in all the usual 'meeting places'. Neem oil is a natural insecticide. It has anti-septic and anti-bacterial properties, it's safe and it will also repel fleas. Eucalyptus, lavender and cedar oil are also said to be natural insecticides. Don't put these oils directly onto your dog's skin. Essential oils need to be mixed with a 'carrier' such as almond oil otherwise they're too concentrated and may cause irritation. Whichever essential oils you decide to use, it's important that you closely follow the manufacturer's instructions on the packaging, and especially any instruction for dilution. Checking your Cocker's coat and skin regularly will help to keep dog ticks and fleas in check and will allow you to remove them quickly, before they can do any serious harm to your pet. Always wear disposable gloves to protect your own health and make sure you dispose of the tick carefully. Water won't kill a tick, so flushing a live one down the toilet isn't the answer. Keep it in a small jar of rubbing alcohol for 3 months just in case it's needed by your vet. If it's not needed it can then be safely flushed away. Don't take any chances with your Cocker Spaniel's health - stay healthy my friends!